​Myofacial Release (MFR) is a gentle therapy which works with the connective tissue of the body. This tissue is like a web surrounding every cell, tissue and organ. It provides support and flexibility to all tissues in the body. Often modern medicine ignores this interwoven network however releasing restriction with in this web can often be the missing link in resolving causes of pain and discomfort. The type of Myofascial Release (MFR) that therapist Karen Baker practices was pioneered in the US by PT therapist John F Barnes. It is a whole body hands on approach. Myofascial – pronounced myo-faschal – is derived from the Latin words (myo – muscle and fascia – band). The fascial system is a three dimensional spider’s web, that connects and surrounds every system and cell in the body covering you from head to toe. Through trauma and repetitive motion or positioning (either lifting or sitting all day) restrictions can form in the fascial system. None of these restrictions can be seen by any X-ray or imaging machines that are currently being used in the medical profession. Modern medicine tend to looks at muscles, bones and organs in isolation, generally ignoring the importance of the global system that connects it all together. This can sometimes leave patients suffering with unresolved physical pain . These restrictions can become tighter over time, literally making you feel like you are wearing a strait jacket. Releasing these tight bands throughout the body will decrease pain. Increase blood flow and nutrition to the body, which will improve overall health down to the cellular level. MFR therapy is different therapies in that we do not use oils, lotions or follow a routine. The body is allowed to release these restrictions in a natural way. A treatment consists of engaging the barrier of restrictions or (taking the slack out of the system). After 90 – 120 seconds the fascia will begin to release, but studies have now shown if this is held for 5 minutes or more, a greater response can be felt. A release may feel like butter melting, you may feel a burning sensation, pulsing, tingling or a release of heat. This is your body talking to you. Advanced Remedial Massage and Advanced Myofascial Therapist. Karen is a full-time Myofascial therapist working at MFR UK’s clinic north of Glasgow as well as in Rosyth, Edinburgh and London. 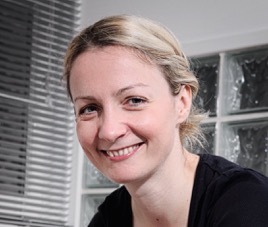 She is an advanced sports and remedial therapist and has trained with The Scottish Massage Therapy Organisation. She has a keen interest in soft tissue dysfunction and began her MFR journey by completing her training in Integrated Myofascial Therapy with MFR UK. Karen has also attended USA MFR seminars with John F. Barnes and has completed her internship in his Arizona treatment centre. ​Karen’s main focus is with the body/mind connection and the role of the unconscious mind in physical tension and pain, both literal and symbolic. Karen also uses a variety of complementary therapies that tap into this connection allowing her to add those skills to her treatments. Karen assists on many of MFR UK’s workshops as well as instructing on the myofascial unwinding workshops. Karen completed her MFR training programme with John F. Barnes in the USA in October 2009.